The global commercial flour market depicts a highly fragmented and competitive vendor scenario, notes Transparency Market Research (TMR). This competitiveness can be attributed to the emergence of a large number of small- and large-scale vendors in the commercial flour market. Bay State Milling Company, Red Mill Natural Foods, Hodgson Mill, and ConAgra Foods are leading players operating in the global commercial flour market. Many large-scale companies in the market are adopting various strategic alliances for strengthening their foothold in the global commercial flour market. These players are also working on enhancing their product quality in order to outshine their rivals between each other. A few effective strategies adopted by medium sized vendors in the global commercial flour market include constant product improvement and expanding their geographical boundaries. Such strategies help the market players to gain lucrative opportunities in the future in terms of revenue generation. The competition among players is getting intensified due to the entry of several local players who are concentrating on manufacturing state-of-the-art flour products. According to experts from TMR, the global commercial flour market is expected to gain revenue worth US$8.93b52, 518.6 mn by the end of 2025. The market was valued US$44,008.3mn in 2017. Experts project this growth to occur at a promising CAGR of 2.2% during the forecast period from 2017 to 2025. Among various types of products in the market, the wheat flour segment is expected to boost the global commercial flour market during the forecast period. This is because of the increasing buyer’s demand for wheat flour related food. With respect to geography, Asia Pacific and Europe are expected to account for a leading share in the global commercial flour market in the coming years. This is attributed to the rising per capita consumption of commercial flour in these regions. Wheat is the most common and widely produced cereal in the globe. Wheat flours are extensively used as a crucial ingredient in the making of bakery items, bread, and crispy coating of fast food and fried food. Wheat flour is also widely used in making several mouthwatering food items include burgers, donuts, fried meat, and cakes. Growing demand for quality flour among consumers and rapidly changing lifestyles of consumers from traditional to modern are the factors majorly driving the global commercial flour market. Along with this, rising health concerns for consuming high-protein flour and growing consumers’ inclination towards gluten-free flour alternatives are also provide an impetus to the growth of the global commercial flour market. 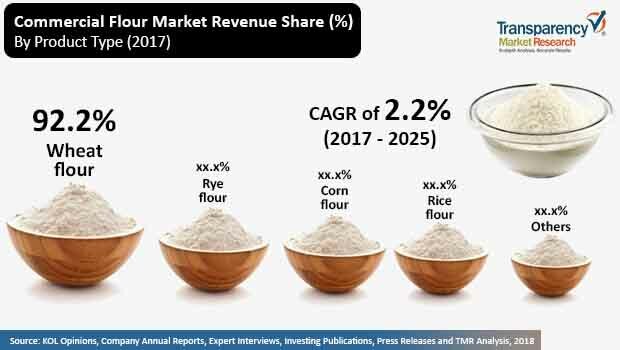 Furthermore, rapidly changing consumers’ preference towards tasty foods and rising sales of confectionary and bakery products are also boosting the global commercial flour market. Apart from this, increasing demand for convenience food products and growing advanced retail platforms such as food shopping centers and supermarkets for selling various food items are also propelling expansion in the global commercial flour market. Rapid emergence of instant food products has reduced the utilization of natural flour. Along with this, variance in costs and low accessibility of crude materials are another factors hindering the growth of the global commercial flour market. Nonetheless, persistent demand for tasty and crispy food and mushrooming food industry worldwide is believed to help overcome such challenges in the near future. The review is based on a market research report by TMR, titled, “Commercial Flour Market (Type - Wheat Flour, Corn Flour, Rye Flour, Rice Flour, and Others; Nature - Organic, Conventional; End-use - HoReCa, Food Industry) - Global Industry Analysis and Opportunity Assessment, 2017-2025”.